Wolf Creek Indian Village & Museum is located in Bastian, Virginia in Southwest Virginia. We are a museum based upon an actual archeology site known as the Brown-Johnston site. 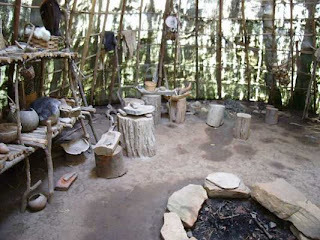 The site was discovered in 1970 during the process of construction of Interstate 77.Our recreated Indian village was first built in 1996 using a combination of man made and natural materials. The village structures were placed according to the actual site map. A combination of weather and size eroded the structures over the years. We are now “rethinking” the building of the village. The first reconstruction did mimic size, but it did not mimic all the actual features or the posts of each structure. 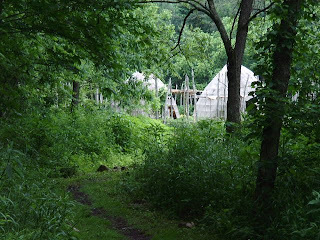 Through new research about American Indian architecture we are rediscovering our village site in a different light in the second reconstruction. We are taking each and every feature and post and place them to have the village teach us how it was built. Though we cannot know for certain how it was exactly built, we can say we have each and every post or feature represented. It is looking at our site with new eyes. We hope to have the village reconstruction completed in 3 years if funding and volunteer muscle can be found. To get to the village from the museum you must take a little walk down the hill. On your way you can see wildflowers, chipmunks, various trees (some labeled for your education), and upon crossing the bridge - a glorious patch of skunk cabbage. Bethany weeding one of the small gardens inside the palisade wall. Wolf Creek in the winter time.